Magdalena Dziaczkowska analyzes the process of drafting of the Nostra Aetate (1965), the declaration on the relation of the Church with non-Christian Religions of the Second Vatican Council. Her interest focuses particularly on the Jewish contributions to this document. 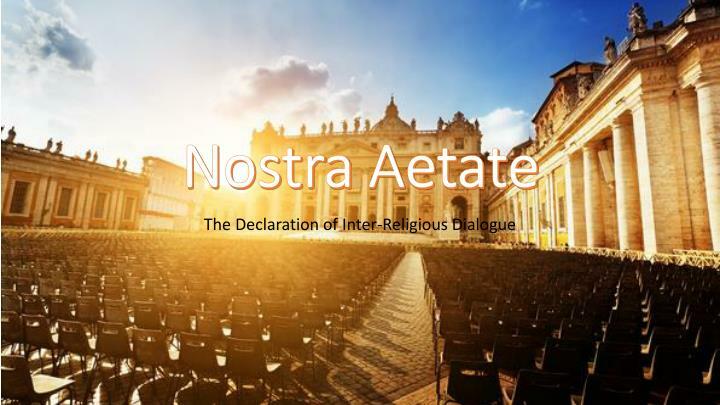 Nostra Aetate remains one of the favorite topics of research for those who study interreligious relations in the most recent, postwar history. This paper will concentrate on the origins of this famous document but specifically on the Jewish contributions to the process of its creation. It remains a very interesting phenomena per se because no other non-Christian faith adherents had such an impact on official Church documents and teaching. As it was rightly observed by Fr. Thomas Stransky, an insider at Vatican II and a member of the Secretariat for Promoting Christian Unity, in its beginnings The Declaration on the Relation of the Church to Non-Christian Religions, more commonly known as Nostra Aetate, was the shortest of the statements promulgated by Vatican II. In spite of its brevity, it became one of the most influential documents of the Council and gave birth to the interreligious dialogue carried on in the following five decades. It was particularly meaningful in shaping and developing Catholic-Jewish dialogue and reflecting on the past attitudes of the Catholic Church to the Jewish people. “For most readers forty years later, Nostra Aetate stands by itself, without a history. The end product is stripped of its unpredictable and threatened journey of surprises, setbacks and blessings along the way”. In fact, by then there were hardly any publications focusing specifically on the preparation process of Nostra Aetate. One contribution, still quite recent, that deserves to be mentioned is Augusto Sartorelli’s Il Concilio Vaticano II e la ridefinizione dei rapporti della Chiesa con il popolo ebraico published in 2003. Obviously, the available publications did not lack information on the preparation process entirely but it was not one of the main research topics for forty years following the events. Now, over a decade after Fr. Stransky’s complaint, readers have a wider choice of articles that concern the origins of Nostra Aetate and, at least for some of them, it might not be as stripped of the complicated story behind its promulgation as it seemed to be ten years ago. In the volume containing the proceedings of the international conference held in Jerusalem in late October and early November 2005, published in 2007, there are four contributions, apart from the aforementioned article by Fr. Stansky, that attempt at shedding new light on the origins of Nostra Aetate. The first one, by Marco Morselli, is dedicated to Jules Isaac’s influence and his role at the wake of the Council; in another one, Annarita Caponera examines relevant documents available in the Vatican Archives; and in the third one, Uri Bialer offers an interesting perspective on the Israeli political attempts to establish relations with the Holy See and their outcomes in relation to Nostra Aetate. Apart from them it is worth to notice the ecumenical point of view highlighted in Marco Velati’s The Debate on De Judaeis and Ecumenical Dialogue which does not strictly focus on the origins but provides some interesting insight into this topic all the same. The most extensive and thorough study, however, is a lengthy article by Mathijs Lamberigts and Leo Declerck, published in the series of Louvain Theological and Pastoral Monographs in volume 40, edited by Marianne Moyaert and Didier Pollefeyt. It is very well structured and helps to understand the various dynamics active behind the scenes of the Council when the Secretariat for Promoting Christian Unity was working on the preparation of the document on Jews. When it comes to the Jewish involvement and role in the preparatory stages of the work on Nostra Aetate, apart from the aforementioned article on Jules Isaac, there are several interesting publications on the engagement (or disengagement) of Rabbis A. J. Heschel and J. B. Soloveitchik in the work of Vatican II. The earliest one, penned by Reuven Kimelman, was published in 2004 and was dedicated to both figures. In 2008 a non-academic paper on rabbi Heschel, "American Jewish Committee and Nostra Aetate" was published by Gary Spruch under the aegis of the AJC and a year later a study on rabbi’s Soloveitchik attitude towards the Council and theological dialogue Rushing in Where Angels Fear to Tread was published by Yigal Sklarin. The most recent contribution, a personal text by Susannah Heschel regarding A. J. Heschel’s relation to Vatican II, came out on the occasion of the fiftieth anniversary of the promulgation of the document. One may notice that in the publications focusing on the origins of Nostra Aetate Jewish contributions are mentioned. Frequently, Jules Isaac’s role is highlighted; there are also mentions of Nahum Goldman, president of the World Jewish Congress, and of A. J. Heschel, but usually the main interest of the authors is drawn to inter-Vatican political and theological complexities as well as external tensions, mainly of political nature, such as the opposition of the Arab countries etc. This paper aims at presenting a slightly diverging perspective: a concise and clear history of Nostra Aetate’s origins with a special attention directed to the Jewish contributions to the creation of the document. Even if in the preconciliar consilia et vota solicited in 1959 there was no mention of the Jewish question and one could have an impression that it is not the will nor interest of the Church to work on a theological clarification of Catholic-Jewish relations and the issue of anti-Semitism, there was a silent work done in this field even before Pope John XXIII established the Secretariatus ad christianorum unitatem fovendam (SCUF) and gave it the mandate to work also in the field of Catholic-Jewish relations. This period, called here the prehistory of Nostra Aetate, will be shortly described below. Catholic-Jewish or Christian-Jewish relations were not in a good condition for almost two thousand years and, undoubtedly, the Holocaust was a peak of all the anti-Jewish superventions in the history of the world. In light of that, it might seem very surprising that there was almost no reaction and self-reflection regarding anti-Semitism within the Church. Taking that into account, one may not be astonished that the mere fact that the Jewish question became one of the responsibilities of the SCUF, reflecting to some extent the ambiguous attitude of the Church towards the Jewish people, was a source of concern for many Jews who feared Catholic attempts at conversion. In spite of the lack of interest in this matter among the majority of the Church’s clergy, Nostra Aetate was not an incident and few initiatives preceded and paved the way for this document. One of them, an early reaction to the tragedy of the Shoah, was the interreligious (ecumenical on Christian side) Seelisberg Conference in 1947, where German Catholic bishops were present as well. The Conference’s aim was to reflect on the sources of anti-Semitism and the ways to combat this destructive attitude. Its outcome – the document known as the Ten Points of Seelisberg – proved to be one of the cornerstones of the later conciliar work on the document describing the Catholic view on the Jews. One of the conference's participants was a French Holocaust survivor, Jules Isaac, who would later play a very significant role in convincing the pope to include the Jewish question into the conciliar area of interest. He was a renown historian who lost his wife and daughter in Auschwitz and already during the war started to investigate Christian writings (starting with the New Testament) in search for the sources of anti-Semitism in Christian Europe. In the postwar period, not only did he publish several books on that topic, (such as, for example, Jèsus et Israël, Genèse de l’antsémitisme or the most famous L’enseignement du mépris) but also founded the Paris-based group Amitié judéo-chrétienne, in view of “improving the exchange of information between both religions”. In that period Isaac also participated in a ICCJ meeting in 1948 and followed the work of the World Council of Churches closely. In 1949 he had a chance to briefly meet Pius XII during a public audience in Castel Gandolfo. He used that opportunity to hand him the Ten Points of Seelisberg but there was no possibility of a longer conversation. In 1960 he met another pope – John XXIII – and that meeting bore much more fruit. The dynamics on the Catholic side were unfolding slowly, which is a very interesting subject in itself, but unfortunately not researched extensively. On the one hand, there were Catholics who participated in the Seelisberg Conference, were involved in the work of Amitié judéo-chrétienne and other similar organizations, and in consequence -- felt personally responsible for the betterment of the Catholic-Jewish relations, concentrating on the exclusion of anti-Semitic attitudes. On the other hand, there was also a small group of scholars who wanted to clarify the relation between the Church and Jews from a theological standpoint. Among them, there was a group of European scholars, gathered by a Dutch priest -- Anton Ramselaar, who started to work on a statement on Jews in 1958, before John XXIII’s conciliar plans were revealed. They handed the document to Cardinal Bea in August 1960, a month before he knew of the papal mandate. Another report came from the Seton Hall University, New Jersey, from the Institute for Judeo-Christian Studies founded and directed by John Osterreicher. In 1959, in consilia et vota, we also find a carefully worded contribution on the avoidance of anti-Semitism submitted by nineteen Jesuits of the faculty of Rome’s Pontifical Biblical Institute. “As former Jews, both Theodore and Alphonse felt that they had a unique understanding of the historical oppression of the Jewish people. While conversion was certainly part of their overall mission in the Church, in their schools and orphanages, they sought to create a safe spiritual home for all children and a place of welcome for Jewish women. The actual work of Our Lady of Sion was largely one of education, and the Ratisbonne brothers were intensely respectful of the religious wishes of the parents of their students”. One may say that given the supersessionist convictions of the Church in those days, Sisters of Sion did what was possible on the way to salvation and reconciliation by creating a safe haven for Jewish underprivileged youth. They were connected to the postwar events in the Jewish-Christian dialogue, for example through a friar from the male branch of this congregation, Paul Démann, who attended the Seelisberg Conference and remained in contact with Jules Isaac. In the 1950s the congregation, having acknowledged the need for a reformulation of its call, issued documents weakening its stand on the conversion of Jews and highlighting the question of creating bonds of friendship with the Jewish people. Later, during the Council, many Sisters played an invaluable role “on the backstage” – informing scholars and Conciliar Fathers about Jewish-Catholic relations and Judaism as well as publishing scholarly articles on these subjects. The pope’s will to gather the Council was announced on Jan 25th, 1959 and soon the preparatory work started. Part of it was collecting “wishes and desires” (consilia et vota), as it was mentioned above. In those wishes, as Fr. Stransky recalls, there was scarcely any concern raised about the Jewish-Christian relations. However, already on Good Friday 1959, John XXIII made the term perifidi disappear from the traditional intercession prayer for Jews. Thus, things had already started to change, though they were not to take full shape until six years later. Already on June 5th,1960, over two years before the Council was opened, Pope John XXIII founded the Secretariatus ad christianorum unitatem fovendam (SCUF) more commonly known as the Secretariat for Christian Unity and appointed Cardinal Bea its first president. Eight days later a historical meeting between the Pope and Jules Isaac took place, in which the latter handed a Dossier regarding Jewish issues to John XXIII and asked the Pope if he can foster any hope, to which the Pope answered, “You have a right to more than hope!”. Undoubtedly, that meeting became a trigger for the long chain of events that finally led to the promulgation of Nostra Aetate. The mission to examine the Jewish question, together with the materials submitted by Isaac, was entrusted to Cardinal Bea and his Secretariat. Its members were informed about that enlargement of their responsibilities on the first meeting, held in mid November 1960. Several weeks before that, in late October 1960, Cardinal Bea met Nahum Goldman from the World Jewish Congress in the hope that he might represent the whole of Jewry, and requested from him a memorandum on Jewish recommendations for the SCUF. Cardinal Bea’s main goal for this meeting was to make sure that there would be only one memorandum allowing the SCUF to avoid the chaos of numerous responses from dozens of Jewish organizations. Goldman was probably also meant to be a Jewish observer to the Council. On December 8th, 1960, Goldman called a meeting of Rabbis from different denominations in New York and presented them the question of Jewish participation in the Council. Jewish religious leaders opposed and Orthodox organizations have ruled against it. The issue of the Jewish representation at the Council gave rise to a disagreement in which two main standpoints are discernable. Rabbi Abraham Joshua Heschel argued that the dialogue with the Catholic Church is necessary and inevitable, while Rabbi Joseph Ber Soloveitchik was against Jewish-Christian theological-religious dialogue, including Jewish presence at the Council which he viewed as a purely religious event, with the exception of the dialogue on completely secular, societal issues. Before the opening of the Council, Cardinal Bea met not only with Goldman but also with many other significant Jewish figures. An organization that was particularly active in forming relations with the Vatican was the American Jewish Committee which was granted a privilege of having a series of audiences and discussions with Cardinal Bea regarding the document De Iudaeis. As a result of the first audience, which took place in July 1961, Cardinal Bea requested a memorandum on anti-Jewish elements in Catholic religious instruction to be prepared and sent to him by the organization. In fact, in response to this desire, the AJC prepared and sent two memoranda in the summer and fall of 1961: The Image of the Jew in Catholic Teaching and Anti-Jewish Elements in Catholic Liturgy which were later followed also by a memorandum prepared by Heschel and titled On Improving Catholic-Jewish Relations. After sending the memoranda, the AJC decided to reinforce their position by arranging a personal meeting between Cardinal Bea and the AJC representatives. As it is known, in that period Rabbi Heschel worked very closely with two AJC professionals – Zachariah Schuster and Rabbi Marc H. Tanenbaum, a director of interreligious affairs who was also Heschel’s student at the Jewish Theological Seminary. From the latter, we have a detailed description of Heschel’s involvement in the process of drafting Nostra Aetate. In November 1961, Schuster and Heschel, accompanied by a certain Dr. Herkheimer from Frankfurt, were sent to Rome, in order to present some positive suggestions for the improvement of Catholic-Jewish relations. They were received very warmly and invited to create a set of recommendations for the use of the SCUF. As a result, a document containing them was submitted in May 1962 followed by the third memorandum, crafted by Heschel in cooperation with AJC's Interreligious Affairs Department. Meanwhile, Cardinal Bea and his Secretariat worked on the materials that had been gradually provided. The Jewish question was consigned to the sub-commission 10 with Gregory Baum and John Osterreicher as leaders in charge. As the work on the text progressed, by August 1961 it became “clear that presentation and approval of a positive text on relations with the Jews was far from evident” in certain traditional Catholic circles. At the same time, the efforts of the SCUF became known to the Arab world and first objections from this environment started to arrive. Apparently, in the Middle-East, religion and politics were so closely interconnected that it seemed impossible for Arab politicians that the declaration on Jews would not at the same time constitute a declaration of political support towards the newly established state of Israel. Throughout the whole process of drafting the document concerning the Jewish question, this point of view and constant protests from Arab political leaders and bishops from the Middle East resulting from them, were a serious challenge for the SCUF and a threat to the promulgation of such a document. Apart from that, it created many tensions between the SCUF and the Secretariat of the State of Vatican which was responsible for foreign affairs. As if the political situation was not delicate enough, a serious faux pas on the Jewish side occurred in June 1962, a few months before the opening of the first session of the Council. A week before the draft of De Iudaeis (Text A) was to be discussed in the Central Preparatory Commission, the news reached Vatican that Dr. Chaim Vardi was appointed an “unofficial observer” to the Council by the World Jewish Congress. This nomination proved to be highly problematic because Vardi was the counselor on Christian Affairs at Israel’s Ministry of Religions and he was publicly endorsed by Golda Meir (at that time Minister of Foreign Affairs) and Zerah Warhaftig (Minister of Religious Affairs) which gave a political tone to the appointment. In view of predicted political repercussions, the Secretary of the State, Cardinal Cicognani, decided to withdraw De Iudaeis from the agenda of the Central Preparatory Commission and Vardi ended up as an observer with a position equal to journalists and no official recognition from the Holy See. During the first session of the Council, which was opened on October 11th, 1962, the schema on the Jews was not to be discussed. The second session of the Council took place a year later, starting on September 29th, and the year of the first conciliar intersession witnessed many changes -- the most significant of them being undoubtedly the death of John XXIII. The pope beloved by many, passed away in June 1963 and was succeeded by Paul VI who was feared to be more moderate in his views on Catholic-Jewish relations. In the intersession time, in March 1963, Cardinal Bea undertook a journey to the United States in order to present and promote his agenda. He presided over a Catholic-Protestant colloquium at Harvard University and had meetings with many Jewish leaders in New York and Boston. Rabbi Marc Tanenbaum recalls a few confidential meetings held by the Cardinal with several Jewish scholars. According to Tanenbaum, when seeing him and Heschel in Boston, Bea told them “that Pope John was exploring the possibility of establishing diplomatic relations with the State of Israel as a dramatic gesture of good-will toward the Jewish people”. Apart from this promising conversation, Bea met during a private conference, held in the AJC building in New York on March 31st, with Jewish leaders from institutions such as the Jewish Theological Seminary, the Rabbinical Seminary of America, the Synagogue Council of America, the Central Conference of American Rabbis, and Yeshiva University, in order to discuss the declaration on the Jews and problems that it might raise. Heschel presided over this meeting. Among the points that were addressed were inter alia the deicide charge, anti-Semitisms as well as interreligious dialogue and cooperation. During the second session, on November 8th, 1963, a document entitled De Catholicorum habitudine ad non christianos et maxime ad Judaeos (Text B) was distributed as a part of chapter 4 of De Oecumenismo. The text was brief and highlighted topics which were previously discussed during the meeting held by Bea with Jewish leaders: the unique place of Judaism among other religions, Jewish roots of Christianity and Jewishness of the Virgin Mary and Apostles. Moreover, it rejected the Jewish responsibility for deicide and the view that they are cursed by God. Unfortunately, it was not discussed as such during the session; howeverreferences were made to it during the discussion of the three first chapters of De Oecumenismo and while presenting the general report, Cardinal Cicognani made positive comments on the love of the Holy Scriptures uniting Jews and Christians. Even though Cardinal Bea said repeatedly that the approach of the text is purely religious, bishops coming from the Middle East saw the text as inopportune and threatening for the situation of the Christian minority in the Arab countries. Other bishops found that the text should include also other religions that surround Christians in Asia and Africa – such as Islam, Buddhism, Confucianism etc. There was also a group of Conciliar Fathers and scholars who were not convinced that there is a need of a separate text on Jews, even though they had a positive attitude towards Jews and Judaism. In addition, there were also those Council participants who simply opposed, and finally those who preferred an independent text on the Jews and regretted that relevant chapters were not discussed. Nevertheless, the Conciliar Fathers had the opportunity to submit their written remarks concerning chapter 4 and chapter 5 that were not discussed. The careful proceeding with the text resulted to a great extent from the diplomatic protests stemming from political tensions in the Middle East (Arab-Israeli conflict) and theological critique which even if pronounced by the minority, was considered in a serious manner. It is known from the correspondence between Bea and Heschel that the latter was aware of the negative trends that started to unfold. Moreover, he had some critical remarks on the iteration of the text. At the request of AJC, he went to Rome in late November 1963 where, due to the pressure from conservative and Arab circles, he was not received by Bea but by his secretary, Msgr. Willebrands, who promised to convey Heschel’s perspective to Cardinal Bea and the SCUF. Following the meeting with Willebrands, Heschel met also with Cardinal Meyer of Chicago as well as with Protestant observers to the Council in order to present his views and gain their support in which he succeeded. After the end of the second session, on December 7th, Pope Paul VI announced his pilgrimage to the Holy Land “in order to venerate personally the holy places where Christ was born, lived, died, and ascended into heaven after his resurrection” and “to beg for divine mercy in favor of peace among mankind… to plead with the Lord Christ for the salvation of all humanity”. The pilgrimage was planned for January 1964 and had also ecumenical goals such as seeking reconciliation with the Orthodox Church and meeting with the Patriarch of Constantinople, Athenagoras, upon his own initiative. The visit was to be completely apolitical and in order to avoid any political implications, the Pope landed in Jordan and when addressing king Hussein of Jordan and Zalman Shazar, the president of Israel, he underlined the spiritual character of his pilgrimage. In Bethlehem, on January 6th, the Pope delivered a homily in which he addressed all those believing in one God and spoke about “smoothing the path towards dialogue” with other Christian denominations. Regarding the Catholic-Jewish and Vatican-Israel relations, the pilgrimage did not seem to bring any changes. The second intersession, inaugurated with the pope’s pilgrimage to the Holy Land, was a period of intense work on the text on Jews. The SCUF was granted freedom of decision as to the form of the text -- whether it ought to be preserved as a part of the schema on ecumenism or constitute an independent declaration. During the plenary meeting held in late February and early March 1964, the SCUF decided to maintain the text on Jews, given its objective importance, and to relocate it to the appendix to the schema on ecumenism. In addition, this version of the text (Text C) took into consideration remarks of the Conciliar Fathers. It was submitted to the Coordination Commission on April 16th. The Commission, having in regard the sensitivity of the Arab world, suggested that the Jewish question should be placed in the wider context of a statement on monotheistic religions, thus founding the declaration on the Jews on universal criteria such as the shared source of religion, being children of the same God, universal fraternity of all mankind, and rejection of every form of racial or national oppression. The SCUF followed these suggestions in the fourth text (Text D) entitled Declaratio de habitudine christianorum ad Iudaeos at ad universam familiam humanam which was approved by Bea on May 2, 1964. In that text, the Catholic-Jewish relation was put in a new interreligious light replacing the previous ecumenical perspective. The text was divided into three subsections dedicated to the following topics: common heritage of Christians and Jews, all human beings sharing the same God as their father, condemnation of every form of discrimination. On May 6th 1964 Bea submitted the Adnexum to the pope and after implementing his suggestions (in Text E), added a few more changes (Text F). The Coordination Commission accepted it on June 26th, 1964. Meanwhile, on May 17th, Paul VI announced the establishment of the Secretariat for Non-Christian Religions, later named Pontifical Council for Interreligious Dialogue and appointed Cardinal Marella as its first chair. The SCUF, however, remained responsible for the work on the document regarding the Jews. Two weeks later on May 30th, another audience with the Pope for the AJC took place during which the AJC delegation raised an issue of the deicide, reminding of a recent speech delivered by Cardinal Spellman before the AJC in New York. The Pope referred to it, answering that he had read the address of Spellman and that he shares his sentiments. Moreover, during the meeting, Paul VI acknowledged the close connections between Christianity and Judaism and deplored the Jewish suffering throughout the history. Soon the openness of the new pope was confirmed by his first encyclical Ecclesiam suam published on August 6th, 1964, in which the pope explicitly referred to Judaism and Islam, and expressed hope that all nations will eventually worship one God, retaining however the conservative point of view in claiming that Christianity is the only true religion. Despite these signs of gradual opening of the Church towards Judaism, the Arab fraction actively opposed the text on the Jews. The Melkite bishops, for example, gathered during a meeting held between August 17th and 22nd, asked for the removal of the Jewish question from the conciliar agenda, which was communicated to the Holy See by the patriarch Maximos IV Saigh. The same point of view was presented in a letter from the Coptic patriarch Sidarouss who feared that such a text would have a very negative impact on the situation of the Christian minority in Arab countries. Several weeks before the opening of the third session of the council, on September 1st, 1964, The New York Times published a poor translation of Text D which was not well received in the Jewish circles. As recalled by Tanenbaum, there was no explicit denial of the collective Jewish responsibility for the death of Jesus; the particular character of anti-Semitism was not recognized even if hatred of Jews was “reproved as one among many kinds of human wrong”. A sentence that raised special concern was the one expressing hope for an “eventual union of the Jewish people with the Church” which could be understood as missionary. The AJC soon released a statement in which it objected to the conversionary implications and expressed resentment towards “any declaration, no matter how well intended, whose effect would mean […] the elimination of Judaism as a religion”. He concluded with expressions of hope that the Conciliar Fathers will have an opportunity to vote on a statement that will “eradicate sources of tensions between Catholics and Jews”. Rabbi Soloveitchik, since the beginning averse to the Jewish-Catholic dialogue, was thus ensured that his initial ideas were right and that the Church had initiated the dialogue simply as a new way of converting Jews. The third session of Vatican II started on September 14th which was also a day of the meeting between Paul VI and Rabbi Heschel. In reaction to the text that appeared in The New York Times and fearing that the conservative forces might negate the forgoing efforts to improve the Catholic-Jewish relations, the AJC arranged an audience with the pope for Heschel on the eve of Yom Kippur. During the audience that lasted circa 35 minutes, Heschel presented his views on the four disputed points of Text D, focusing on the fragment that might be understood as missionary. The pope’s attitude was very friendly, yet firm. His opinion was that the text was amicable to the Jews and that as a document of the Church it cannot be changed on the request of outsiders. At the same time he justified some of the passages (on conversion and on deicide) as based on the New Testament which would signify that Jews do not have to agree with them. He also reminded Heschel that for many members of the Church the declaration is too progressive and in case the pressure is too high, it might be also completely taken off the agenda, concluding that the decision depends entirely on the Council Fathers. Paul VI received a lengthy theological memorandum from Heschel, which he promised to convey to the SCUF. A few days later, on September 17th, a significant number (170 out of 240) of American bishops met urgently and requested the return of the original text on the Jews. A week after this conference, on September 25th, Cardinal Bea introduced the schema to the Council, and during the five following days the text was discussed, revised and presented again to be voted upon almost a month later, on November 20th. The large majority of the assembly supported the text and asked for its strengthening while the opposing minority consisted of three groups: representatives of Eastern Catholic Churches in the Middle East, who raised objections of political, pastoral, ecumenical and interreligious nature; conservative Italian, Spanish and Latin American bishops claiming that this document is against the magisterium Ecclesiae; and Asian and African bishops feeling that all main religions should be included in it, not only Judaism. At the same time, there was also a pressure of another kind, coming from the Presidents and the Coordinating Commission, urging the Conciliar Fathers “to reduce the materials and integrate them into the major schemata” which posed a threat that fragments of the document on the Jews would eventually be inserted into other more important texts such as On Divine Revelation (De Iudaeis), On the Church (non-Christian religions) and Church in the Modern World (rejection and condemnation of racism, discrimination and anti-Semitism). This solution would also resolve the Middle Eastern problem with a statement on the Jews. In the following two months the SCUF worked on reiteration of the text, making sure to include also other religions. The final product was a smooth declaration consisting of five paragraphs dedicated to the following topics: the unity of all mankind; the unity of origin, the journey and the ultimate destiny of all men, which are reflected in universal philosophical questions; world religions; Islam and Judaism; condemnation of every kind of discrimination. Regarding Judaism (included in paragraph 4) there were many emendations suggesting a pro-Jewish direction and return to the 1963 text (Text B). The following issues were the crux of the text : deicide charge was clearly rejected, educators and priests were obliged to reprobate and exclude all ideas which could nurture hostility against Jews, all kinds of hatred and persecution towards Jews in all times were condemned and Christians and Jews were encouraged to increase their mutual knowledge and respect. There was no statement that could be understood as a call for conversion to Christianity and the permanence of Judaism was accepted in the words that “even though a large part of the Jews did not accept the Gospel, they remain most dear to God”. In addition, there was an explicit reference to Moses, Jews and Christians as “the descendants of Abraham”, and when quoting Rom 9:5 -- the expression “Paul on the Jews” was replaced by “Paul on his kinfolk”. Cardinal Bea presented this text, entitled Declaratio De Ecclesia habitudine ad religiones non-christianas on November 20th, the last day of the third session, and his presentation was followed by voting. The total number of voters was 1996 among whom 1651 voted placet, 99 non placet, 242 placet iuxta modum. After the approval of the text, the SCUF was supposed to evaluate the modi (proposed emendations). Unfortunately, the reintroduction of the term “deicide” suggested by a significant group of bishops, raised protest from the Arab countries once again which led to tensions between the Secretary of the State, Cardinal Cicognani and the SCUF. “As far as the reactions to the Declaration in the Middle East are concerned, we can rightly ask whether a Declaration even more moderate and less explicit would not provoke more or equal reactions, since the opposition started from June 1962, when the content of the decree was almost unknown”. Therefore in conclusion, I agree that we should do our best to avoid negative reactions in the future. It is also correct to think that among more than two hundred ways suggested by the Conciliar Fathers, there will be much advice on how to give the best possible form to the text. However I have no illusions that we will succeed in satisfying everybody. Moreover I feel that when we get final approval, all countries involved need to be given authoritative clarification on the Declaration in order to avoid any political interpretation. This could be done separately”. Indeed, the reactions from the Arab world were far from positive. Certain sources insinuated that the Catholic Church supported the international Zionist movement and was opposed to Palestinian claims. There were also the media campaigns and street demonstrations against the Church and it was considered to be dangerous for local Catholic communities. As a result, rumors spread that Arab Catholics would become Orthodox. Patriarchs from that region also expressed their concerns: the Armenian patriarch Ignace Pierre XVI Batanian, for example, deemed any special mention of Jews as a persecuted nation unnecessary because other nations (e.g. Armenians) also suffered for the same reason. At the same time, there was also opposition from the Coetus Internationalis Patrum (a group of conservative bishops) who were not ready to accept the acquittal of the deicide charge and based their views on the magisterium and the New Testament. Nonetheless, the SCUF continued its mandate. The sub-commission 10 and then the plenary commission were still working on the revision of the text. Ninety emendations were proposed in reference to the schema and thirty-two of them concerned paragraph 4. Twelve of them were upheld. As stated by Declerck and Lamberigts, “a careful comparison of the text approved in 1964 with revised text presented in 1965 reveals an agreement of more than ninety percent with respect to paragraph 4”: the acknowledgment of common origin (children of Abraham), respect for the Hebrew Bible (Old Testament), recognition of Christ’s and apostles’ Jewishness. As a part of the strategy mentioned in Bea’s letter to Cicognani, in spring 1965, two members of the SCUF, its Secretary, Johannes Willebrands, and Fr. Pierre Duprey, went to see the Eastern patriarchs to present the schema to them and try to answer their doubts. The first journey, to Lebanon and Syria, took place in March, and the second one, to Jordan and Egypt, in April. From the latter, a detailed report by Willebrands is available. In the report, Willebrands recalls a tense socio-political situation resulting from the creation of the state of Israel and the loss of Palestinian property. As a consequence, the Latin patriarch of Jerusalem, Msgr. Gori rejected any possible version of the document on the Jews, deeming the injustice sufficient reason to do so. Moreover, the Christian environment en bloc was against such a declaration, especially the prevalent Orthodox Christians. Also other patriarchs opposed. Maximos IV Saigh, Patriarch of Antioch and All the East, and Alexandria and Jerusalem of the Melkite Greek Catholic Church threatened to leave the Council in case of the approval of the declaration on the Jews, as Paul VI reported to Bea on April 25th. As a result, Willebrands suggested two solutions: either to change parts of the declaration or give it up and use it as guidelines for the activity of the SCUF and the Secretariat for Non-Christian religions. “The Conciliar Fathers, Members of the Secretariat think, almost with unanimity, that the Declaration cannot be withdrawn. It would be a [cause of] shame for the Church and especially for the Council to surrender in the face of such political pressure and it would mean risking [possible] trust in the Council and in the Holy Father as well. Once the Council approved the schema with a stunning majority (just 99 opponents out of 1996), the Council would be unfaithful to itself, if it withdrew now”. In July Willebrands and Duprey undertook a new journey to the Middle East with the purpose of meeting with the patriarchs -- to explain the revised declaration to them and ask for their opinion. They met Patriarch Tappouni of the Syriac Church, Patriarch Meuchi of the Maronite Church, Patriarch Maximos IV Saigh (Melkite) and Latin Patriarch Gori, as well as the already mentioned Armenian Patriarch Batanian and Coptic Patriarch Sidarouss. The messengers of the SCUF wanted to discuss whether the declaration was necessary and opportune. In the end, all the patriarchs approved the document and were prepared to defend it in case of such a need, with the exception of the Latin Patriarch Gori, who was not persuaded even later and continued to raise objections after the promulgation of Nostra Aetate. Patriarch Maximos IV Saigh proposed four emendations, however: (1) in reference to the death of Jesus – it would be wrong to blame all the Jews who lived in the times of Jesus without distinction (indistinctim); (2) more restrictive accentuation of the idea that the Church is the new people of God, (3) in regard to the condemnation of anti-Semitism -- Church condemns every form of persecution, including that of Jews; (4) regarding the Rom 11:28 fragment – the patriarch argued that the passage should be omitted because it contradicts the first part of the same sentence (inimic secundum evangelium). Given the previous progressive form of the document, these emendations were weakening its expression in regard to several points: the bond to the children of Abraham, deicide (no explicit acquittal of the Jews on the deicide charge), rejection of Jewish people by God (it is slightly undermined by the phrase: “Although the Church is the new people of God”); discrimination and anti-Semitism (replacement of “damnat” with “deplorat”). It is worth mentioning, however, that after these emendations were implemented, Maximos IV Saigh, who previously threatened to leave the Council in case of the approval of the text on Jews, was to completely support the declaration during the final session. The last session of Vatican II started on September 14th and lasted for almost three months, finishing on December 8th. Already on September 15th the SCUF brought its activities to a close during the last plenary meeting. In September the embassies of Arab countries were informed about the discussion with the Eastern patriarchs; meanwhile, a special press office was established for the Arab speaking world, providing translation and explanation of the document on non-Christian religions and distributing the translated document among Arab diplomats. Moreover, the visit of Paul VI to the United Nations on October 4th, positively influenced Arab politicians and moderated their opposition. At the same time, the final version of the text together with the Expensio modorum were distributed among the Conciliar Fathers. The text of the declaration was also shared with the press. All of the modi were studied and discussed, although the majority of them were rejected. The opposition to the text made itself present and was based on the arguments that were already raised during previous sessions such as being in contradiction with the magisterium of the Church and having political pro-Israel implications. There was also a small group of bishops who thought that the omission of the words “deicide” and “condemnation” was a mistake and called for a more powerful statement. The ballot on the emendation of the text now called Nostra Aetate, was scheduled to mid-October 1965. Several days before, the Coetus Internationalis Patrum released a polemical document opposing the declaration and requesting a non placet vote from the Conciliar Fathers. The core argument was the deicide charge and the inability to accept the aquittal of the Jewish people in reference to that accusation. In spite of that, the vote on paragraph 4 was overwhelmingly positive with 1,821 fathers approving the document and 245 fathers voting against it. The voting process was preceded by Cardinal Bea’s presentation and report on the activity of the SCUF and its goals during their work on the declaration. He addressed the theological and political arguments that were raised against the document and explained the decisions made by the SCUF regarding the content of the document. Even if the vote was a success and elicited positive reaction in some Jewish and ecumenical circles, such as the AJC or the World Council of Churches, there were still tensions and opposition among Arab and Jewish leaders as well as from some Christian Orthodox circles. In view of that, a few members of the SCUF asked Cardinal Suenens and other moderators to ask the pope to promulgate the text before October 28th or announce that it will be promulgated. Finally, on October 28th, the text was approved definitively. Among 2312 fathers who took part in the vote 2221 voted placet, 88 non placet, 2 placet juxta modum and 1 vote was not valid. Even though Nostra Aetate was not perfect and there was still room for improvement - not only from the Jewish perspective but also from the perspective of the SCUF and many Catholic theologians, it was a powerful statement that changed Catholic-Jewish relations for ever. As the AJC characterized it – it was “an act of justice long overdue” which enhanced “new opportunities for improved interreligious understanding and cooperation throughout the world” and eliminated anti-Semitism from the Catholic perspective. For many reasons that cannot be examined in this paper, the Catholic Church faced numerous difficulties trying to work on the aggiornamento. The Jewish question was a particularly complex challenge for the Council and it is doubtful if the Council ever managed to produce a statement such as Nostra Aetate without external encouragement and help. The fact that questione ebraica was hardly mentioned in the consilia et vota and that there was relatively little interest in the redefinition of the Catholic approach to the Jews and Judaism among bishops proves that it might not have even been included in the conciliar agenda if not for the Jewish intervention of Jules Isaac and the subsequent extensive efforts of the AJC and rabbi Heschel. Obviously, the favor and encouragement received from John XXIII played also a crucial role in the process, but the initial impulse came from the Jewish side. At the same time, differences in the structure of both religious communities – Jewish and Catholic, often caused complications in their dialogue and cooperation. Inopportune decisions, such as the “Vardi affair”, proved that Jews not always knew what the procedures of working with the Holy See were. On the other hand, the Vatican officials were not sure how to approach the Jewish community in its complexity and who can be treated as a representative of the Jewish point of view and the Jewish community as a whole. Nonetheless, the document on the Jews factum est. Without Jewish involvement, most probably it would have never happened. Even if the Jewish question is only a part of it, Nostra Aetate itself is definitely the first fruit of the Catholic-Jewish dialogue and cooperation in almost two thousand years and those who contributed to its creation should be proud of taking part in the tikkun olam. Thomas Stransky, The Genesis of Nostra Aetate: An Insider’s Story, [in:] N. Lamdan, A. Melloni, Nostra Aetate: Origins, Promulgation, Impact on Jewish-Catholic Relations, (Series of the John XXIII Foundation for Religious Studies in Bologna vol. 5), Berlin 2007, p. 29. Augusto Sartorelli, Il Concilio Vaticano II e la ridefinizione dei rapporti della Chiesa con il popolo ebraico, “La Rassegna Mensile di Israel”, 3rd series, Vol. 69, No. 2, Saggi sull'ebraismo italiano del Novecento in onore di Luisella Mortara Ottolenghi, Vol. II (May -- August 2003), pp. 663-680. Marco Morselli, Jules Issac and the Origins of Nostra Aetate, [in:] Lamdan, Melloni, Nostra Aetate: Origins, Promulgation, Impact…, pp. 21-28. Annarita Caponera, Papers of the Secretariat for Christian Unity on Nostra Aetate, [in:] Lamdan, Melloni, Nostra Aetate: Origins, Promulgation, Impact…, pp. 55-62. Uri Bialer, Nostra Aetate: the view from Jerusalem, [in:] Lamdan, Melloni, Nostra Aetate: Origins, Promulgation, Impact…, pp. 63-86. Marco Velati, The Debate on De Judaeis and Ecumenical Dialogue, [in:] Lamdan, Melloni, Nostra Aetate: Origins, Promulgation, Impact…, pp. 145-162. Leo Declerck, Mathijs Lamberigts, Vatican II on the Jews. A Historical Survey, [in:] M. Moyaert, D. Pollefeyt [ed. ], Never Revoked, Nostra Aetate as Ongoing Challenge for Jewish-Christian Dialogue, (Louvain Theological & Pastoral Monographs vol. 40), Leauven – Paris – Walpole 2010, pp. 13-56. Reuven Kimelman, Rabbis Joseph B. Soloveitchik and Abraham Joshua Heschel on Jewish. Christian Relations, ”Modern Judaism”, Vol. 24, No. 3 (Oct. 2004), pp. 251-271. Gary Spruch, Wide Horizons: Abraham Joshua Heschel, the American Jewish Committee and the Spirit of Nostra Aetate, New York 2008. Yigal Sklarin, "Rushing in Where Angels Fear to Tread": Rabbi Joseph B. Soloveitchik, the Rabbinical Council of America, Modern Orthodox Jewry and the Second Vatican Council, Modern Judaism, Vol. 29, No. 3 (Oct. 2009), pp. 351-385. Susannah Heschel, Abraham Joshua Heschel and the Second Vatican Council, [in:] G. S. Rosenthal (ed. ), A Jubilee for All Time. The Copernican Revolution in Jewish-Christian Relations, Pickwick 2014. Consilia et vota were a collection of topics and issues that should enter the conciliar agenda; these wishes and desires came from various Church leaders (bishops, generals of congregations etc.) from all over the world. See Stransky, p. 34. Referred to also as the Secretariat for Promoting Christian Unity, see p. 3. This term was used first by Leo Declerck and Mathijs Lamberigts in Vatican II on the Jews…, p. 15. See for example Arthur Gilbert, The Vatican Council and the Jews, Cleveland 1968, pp. 48-52. On the Seelisberg Conference, see Christian Rutishauser, The 1947 Seelisberg Conference: The Foundation of the Jewish-Christian Dialogue, “Studies in Christian-Jewish Relations”, Volume 2, Issue 2(2007), pp. 34-53. Marc Tanenbaum mentions that in the period 1958-1960 Pope John XXIII entered into discussion with Isaac, however no convincing proof of long-lasting contacts between the two has been found (Tanenbaum, Heschel and Vatican II -- Jewish-Christian Relations, presented at Memorial Symposium In Honor of Rabbi Abraham Joshua Heschel, New York 1983, p. 4). Emma Green, Developing Dialogue: The Congregation of Our Lady of Sion and Nostra Aetate, 1945-1969, published on the congregation’s website: http://www.notredamedesion.org/doc/EmmaGreen.docx, p. 2. The sole account of this meeting comes from Goldman: see Idem, Staatsmann ohne Staat, Cologne 1970. See: Eliezer Greenberg, The Ecumenical Council and the Role of Jewish Organizations. A Special Memorandum prepared by Eliezer Greenberg, 23 January 1963, p. 1. [available in the AJC archives]. On Rabbi Soloveitchik’s position, see Sklarin, Rushing where the Angels…. While preparing the memoranda, the AJC consulted numerous advisors, deriving from all streams of Judaism: Orthodox, Reform, and Conservative in the Americas, Europe, and Israel; from the Orthodox side it was Rabbi Joseph B. Soloveichik, Rabbi Samuel Belkin; from the Conservative side -- Rabbi Louis Finkelstein, Rabbi Heschel; and from the Reform side -- Rabbi Louis B. Freehof. Simultaneously, also Catholic and Protestant scholars were asked for advice and opinion (See Marc H. Tanenbaum, Heschel and Vatican II -- Jewish-Christian Relations, presented at Memorial Symposium In Honor of Rabbi Abraham Joshua Heschel, New York 1983, pp. 5-6). The Image of the Jew in Catholic was to a large extent based on the three Catholic textbook studies co-sponsored by the AJC and the Jesuit St. Louis University. This memorandum focused on hostile references to the Jewish people as a group; improper and dishonest comparisons of Judaism and Christianity; not admitting or acknowledging the Jewish roots of Christianity; biased tendency to present the enemies of Jesus and at the same time ignoring the fact that his disciples and friends were Jewish as well. In addition, the document cited a number of references to the Jews as accursed (as a nation) deicides rejected by God (Tanenbaum, p. 6). Anti-Jewish Elements in Catholic Liturgy concentrated mostly on the deicide charge. It was noted there that certain harmful expressions were already removed from the liturgy (as perfidi from the Good Friday intercession prayer), however biased material is still present in some texts used in the Holy Week and in private devotion. Remembering the horror of the Holocaust, the document called for a rectification of the biased passages that are contributing to the concept of Jews as despised and wicked killers of Christ (Tanenbaum, p. 7). On Improving Catholic-Jewish Relations was a text proposing a view of Jews as integral and autonomous, not an object of necessary conversion; condemning anti-Semitism and rejecting the accusation of deicide; creating a binding document that would shape Christian views of Christianity, as well as special commissions that would supervise the Catholic-Jewish relations, cooperating in civic, social and charitable initiatives etc. (Tanenbaum, p. 8). As stated by Fr. Stransky: “Most solicited or unsolicited material from Jewish sources arrived too late. The SPCU (SCUF) received in mid-March 1962 signed on 27 February 1962 by Nahum Goldman of the WJC and Label Katz, International President of B’nai B’rith. […] Likewise, too late for the SPCU initial draft and known only to Bea was a document from Paris meeting held in late November 1961, together with Professors Zvi Werblowsky of the Hebrew University and Ernst Ehrlich, Basel University and B’nai B’rith activist. Supporting the meeting was Bea, Maurice Fisher, the director-general of the Israel Foreign Ministry, and Aryeh Levavi, the Israeli ambassador to Italy, (see Bialer, Cross on the Star of David. The Christian World in Israel's Foreign Policy, 1948-1967, Bloomington: Indiana University Press, 2005, pp. 74-75). For some reason, Bea never shared this document with any of us (SCUF members)”, (see Stransky, p. 40). This first draft corresponds to what Caponera calls Text A (Caponera, p. 56), and I will consequently follow her nomenclature indicating the version of the text acc. to Caponera in the parentheses. On the content of the text, see Declerck, Lamberigts, pp. 20-21; Tanenbaum, p. 12. See in this regard the interventions of Cardinal Tappouni, Patriarch Sidarouss, and Patriarch Maximos IV Saigh (AS II/5, 527-528; 541-542; 542-544) (after: Declerck, Lamberigts, p. 23). Their proposition was to include the Jewish question in the schema on the Church – specifically in the chapter De populo Dei – or in the schema on the Church in the Modern World and to talk about anti-Semitism in the context of discrimination in general (see Declerck, Lamberigts, p. 24). See Declerck, Lamberigts, p. 24. See http://custodia.org/default.asp?id=779&id_n=24158, date of access 29.09.2016. See http://www.lastampa.it/2014/05/21/vaticaninsider/eng/the-vatican/paul-vis-trip-to-the-holy-land-years-ago-marked-the-dawn-of-papal-visits-nGnyMXQfsRWBjvyqeNk2TJ/pagina.html, date of access 29.09.2016. Bialer writes that Paul VI’s visit was disappointing from the Israeli perspective, given his lack of references to the state of Israel (Bialer, Israel and Nostra Aetate…, p. 83). See Declerck, Lamberigts, p. 26. Stransky, p. 48. Sklarin quoted Rabbi Soloveitchik’s opinion expressed in reaction to Text D regarding those Jews who engaged in the dialogue with the Catholic Church and who served as Jewish ambassadors during Vatican II: 'They should say chatanu (we have sinned) for rushing in where angels fear to tread’ (Sklarin, p. 351). There are hints that Cardinal Bea did not like the revised text, especially the reiteration of the term deicide and other terms that were introduced on Cardinal Cicognani’ s (Secretary of the State) request (see Stransky, pp. 47-48). Tanenbaum recalls that thirty-four Conciliar Fathers spoke during the discussion and the majority of them asked for the strengthening of the text and that the AJC was told by the periti that “on no issue have the fathers been so united, on none have they spoken so forthrightly” (Tanenbaum, pp. 17-18). Quotation after Caponera, p. 60. Declerck, Lamberigts, p. 39; Caponera, pp. 59-60. Quotation after Caponera pp. 60-61. See the report of internuncio Punzolo to Cicognani (March 27, 1965), ASV Conc. Vat. II 1458 (after Declerck, Lamberigts, p. 43). See Leo Declerck and André Haquin (eds. ), Msgr. Albert Prignon, Recteur du Pontificio Collegio Belga: Journal conciliaire de la 4e Session. Préface de Msgr. Aloys Jousten. Introduction par Claude Troisfontaines, Cahiers de la Revue théologique de Louvain, 35 (Louvain-la-Neuve: Faculté de théologie, 2003) p. 269 (after Declerck, Lamberigts, p. 45). Gori was very stubborn in his views and after the ballot he wrote to Bea: “Je ne puis vraiment m’empêcher de penser qu’un tel proceed est peu digne d’un texte conciliaire et je m’en étonne d’un exegete de la classe de Votre Éminence” (AS V/3, 513) (after : Declerck, Lamberigts, p. 45). After: Declerck, Lamberigts, p. 46. See Declerck, Lamberigts, p. 48-49. More on the content of this document and the discourse it presented can be found in Declerck, Lamberigts, p. 49.